Our Featured Volunteer for June is Jessica Evans! Until now, Jessica certainly hasn’t received enough recognition for her volunteer role as Show Secretary. At every on-site training show and at our Downtown Horse Show, Jessica works tirelessly to make sure all entries and riders are in order. Jessica took up this role last year and we are very thankful that she is continuing for this show season! Although an animal lover, Jessica had no previous experience around horses. It was her daughter Lucie (ride 6) who brought her to Lancers. Beyond her volunteering experience, it is the love Lucie has for everything Lancers that Jessica enjoys most! 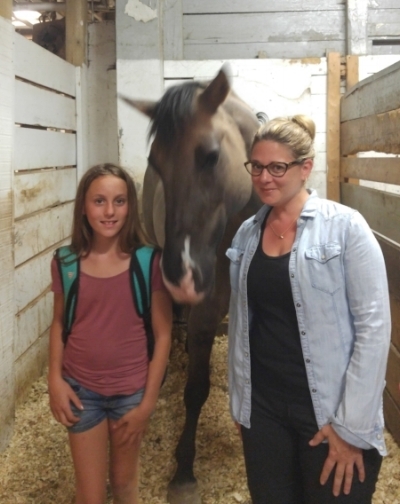 “She has never wanted to miss a lesson and asks daily to go to the barn”, Jessica notes. She then added, “from the horses, friends, instructors, barn monitors, parents and volunteers, it is a truly awesome, positive, fun and safe place for my daughter to be. It is wonderful when your child finds their special, happy place”. When not volunteering as our Horse Show secretary, Jessica and her son Sam make sure to help out as much as possible! They have helped out with hay and shavings deliveries and barn clean up days, have worked at the canteen, and have even driven lots of other kids to horse shows! Although Jessica doesn’t ride, she says she has gained a soft spot for Inga because she is currently her daughter’s favourite horse. Jessica likes that Inga can be a tricky horse to ride and that Lucie loves the challenge! Even Jessica’s son has favourite horses. The police horses, Sarge and Val, are his favourite so they spend a lot of time around their stalls as well! One of Jessica’s favourite memories of Lancers was picking up Lucie from Salmon River camp last August and the drive back to the city. “I don’t think I’ve ever seen her so happy and full of amazing stories from the previous week”, she added! We’re always happy to hear that our volunteers also get something out of their experiences at Lancers. Jessica says that volunteering at Lancers has “been by far my best volunteer opportunity to date”! “Other opportunities in the past”, Jessica notes, “took me away from my children and required a babysitter but Lancers is such a welcoming place and even my son, who used to be terribly afraid of horses, is more than happy to tag along”! In the future, Jessica would love to take a few more riding lessons with her daughter! That, of course, is music to our ears and we think we should put Jessica on our waitlist for the adult beginner course! Our Featured Junior Rider for June is Sophie Hartlen!